I never met my great-grandfather Otto Anderson. I have a photo of he and my great grandmother Mary standing in their farm garden. It was probably taken in the early 1930’s near Zahl, North Dakota. This photo shows a short stature man, wiry, heavily mustached, weathered and wrinkled. He stands in bib-overalls, the attire for a farmer and an occasional carpenter. Fast forward to 2018. Sitting in a corner of my living room is a small white bench that was constructed by him. I have moved it over the years from home to home and room to room. My mother gave it to me with the story that Grandpa Otto made one for each of his seven children. This children-sized bench is simple in construction with only simple curved edge. Other than that is is quite plain, perhaps like the man who made it. It is the only bench that remains in the family. 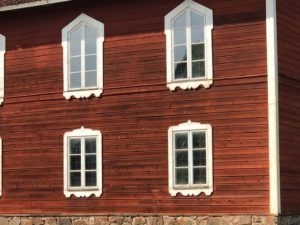 When visiting Sweden and driving through the region where my great grandparents immigrated I noticed the red cottages that were prominent in every village. The majority of all buildings – homes, barns, boathouses, every shed – were red. These red cottages with white corners and other white trimmings are as iconic for Sweden as Dalma horses. Something was very familiar in the simple architectural features. I took many pictures and as I focused on these lovely cottages I became fixated on the window trim. 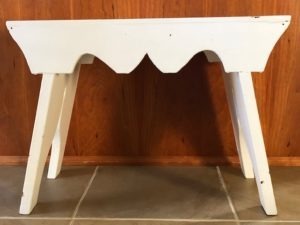 The decorative edge on the windows is the same as on my little white bench. My great-grandfather passed down thru the following generations a memory of Sweden as he made those benches. It was so obvious that there was a direct connection to this lovely little curve. I learned something else about my great-grandfather that day. He noticed like an artist and used his memories into something tangible and visual. Nice work Great Grandfather. 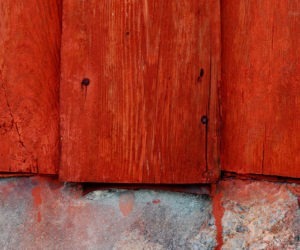 The explanation for Falu Red on all the homes is that the paint is a by-product of the copper mined in Falun, Sweden. The red pigment first emerged as a by-product of the mining. When heated up and mixed with water and starch, it creates a durable paint that since the end of the 18th century has been part of the romantic image of Swedish style. At one time it was also popular because it could make a building resemble European red-brick houses, which were mostly owned by wealthy tradesmen. The all-important Falu red helps protect the wood from fungal infestation and harsh weather conditions. On top of that, the pigment from the red colour absorb a large amount of UV-rays, so the paint lasts longer. Perhaps even a few hundred years. I have just returned from a week long water media workshop. It is something that I have participated in annually since 2011. We only see each other once a year and even then I may not see everyone, depending on their ability to participate from year to year. It is in a neighboring state and over the past seven years I have enjoyed reconnecting with this group of artists. There is nothing more satisfying as working through all sorts of creative dilemmas and problem solving in community. So why do I enjoy this group? What makes our group “click?” I started to create this list. The group members all take risks, and find excitement in that risk. No one in the group is afraid to make mistakes, and share them with anyone who will listen. No one in the group is afraid of what others think. Everyone craves feedback no matter if it is negative or positive. Everyone is motivated and keeps pushing forward. The group members are ambitious. Ambition is not self-rooted. Instead it is about the art. Ambition is cultivate from a love of the creative process-not from self-promotion. They are observant not only as they paint but how they perceive other people, relationships, and other aspects of life. They are original and innovative! I think of this art community as creating “campfire moments” where we can come together to share an experience. This isn’t a meeting, there isn’t an agenda, there isn’t a to-do list. 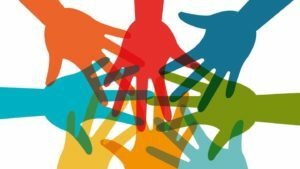 Often art is just a call to come together and be with fellow human beings, which is at the root of the individual transformation.